You won’t be able to wait to host your first barbecue or al fresco dinner after you’ve set up your new Bramblecrest dining suite. 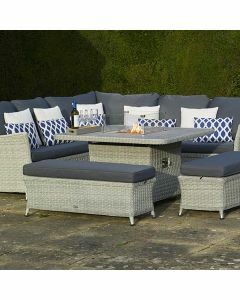 Available in a range of wonderfully stylish looks, they’re designed to look amazing in any garden or patio. The styling is classic – rattan chairs that will see many a happy afternoon, a generous parasol to keep everything comfortable and cool, and attractive tables offering the perfect welcome. Available in a range of seating capacities, from an intimate four-seater right up to the highly sociable eight-seater that’ll see you through the most Mediterranean of meetups.